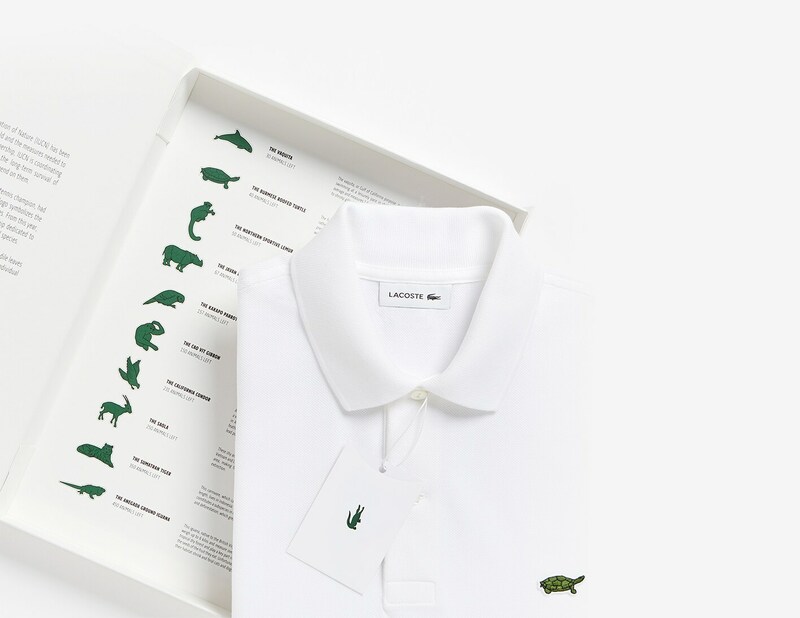 A limited-edition polo collection where threatened species hold the crocodile’s spot. The number of polos produced for each series corresponds to the remaining population sizes in the wild. The Vaquita, or Gulf of California porpoise, is a solitary sea mammal that enjoys swimming at a leisurely pace in shallow waters. It weighs around 48 kilos on average and measures 1.5 meter in length. It is a critically endangered species due to shrimp gillnets in which it can get entangled. The future of this spectacularly-colored freshwater turtle native to Burma looks rather dark. Rampant egg collection for local and distant consumption, easily predictable nesting sites and reproduction periods make it an endangered species with man as its first predator. This primate measures just over 50 centimeters from head to tail and weighs around 800 grams. It can be found in the dry forests of Northern Madagascar. Intensive poaching and the destruction of its habitat for agriculture and deforestation make it a critically-endangered species. Javan Rhinos are very rare, quiet and solitary animals. They are now only found in Indonesia, under the protection of the Rhino Protection Unit, both in plains and rainforest. They are endangered because of their low reproduction rate as well as intensive poaching for their horns. This ape is one of the rarest in the world. Despite weighing between 5 and 10 kilos, the Cao-vit Gibbon can swing from branch to branch with great agility. This gibbon can be found in a forest located at the border of China and Vietnam, where deforestation reduces its habitat. This flightless, nocturnal parrot with yellowish moss green and brown plumage is native to New Zealand and can measure up to 60 centimeters. The male kakapo produces a strange and powerful ‘boom’ call to attract females. It is an endangered species mostly because of its very low reproductive rate. With a wingspan that can reach 3 meters, the California condor is the largest flying bird in America. Its bald head is red orange while its large body is covered in black feathers. Its survival is threatened by lead poisoning and human-induced garbage that pollutes its natural habitat. These shy and solitary herbivores lead a quiet life in the forests and mountains of Vietnam and Laos. But their survival is threatened due to intensive poaching in the area, making the saola one of the only large mammals in critical danger of extinction. This carnivore, which can weigh up to 100 kilos and measure up to 2 meters in length, lives in Indonesia. It is genetically distinct from other territorial tigers and constitutes a subspecies in itself. Nowadays, the main threats it faces are poaching and deforestation. This iguana, native to the British Virgin Island of Anegada, is an herbivore that can weigh up to 6 kilos and measure over 60 centimetres and live in the tropical dry forest. Unfortunately, cattle breeding and agriculture make their habitat shrink and feral cats and dogs find them quite tasty. Alle opbrengsten komen ten goede van het Save Our Species programma. De ene helft gaat rechtstreeks naar IUCN en de andere helft wordt gebruikt om via communicatie onder de aandacht te komen en te blijven. Deze non-profit samenwerking is aangegaan voor de duur van 3 jaar.